Autumn brings with it plenty of blustery days! Yesterday afternoon, the wind entranced my kids as it blew the leaves around on the street and in our yard. They ran along racing with the wind, trying to catch the blowing leaves. It's an exhilarating and exciting experience playing outside on a windy day...so long as the wind isn't so strong it blows you away like in Flora's Very Windy Day! Flora gets upset with her little brother Crispin after he spills her paints. After the incident, their weary mom sends both of them outside. Flora worries about blowing away on the very windy fall day so she wears her super heavy red boots as a precaution, but Crispin goes out unprepared. Still unhappy with her brother, Flora taunts the wind and Crispin gets swept up into the sky by a strong blast. Without hesitation, Flora kicks off her boots and takes off after her brother. The two sail in the sky carried by the wind, and Flora receives several tempting offers from various creatures and entities to take her pesky brother off her hands once and for all. This story is dreamily imaginative, and I simply adore the whimsical illustrations by Phelan. (The drawings remind me a little of those by another one of my favorite illustrators, Tricia Tusa). There are so many wonderful images of the red, and orange and yellow leaves swirling around, making it a magical and exceptional book to read during autumn. 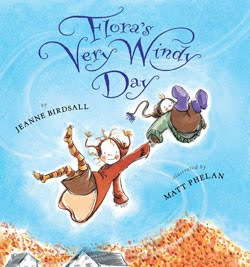 Phelan's drawings of the swirling winds and blowing leaves make me wish that I could take flight on a windy fall day! The illustrations truly stretch the reader's imagination. In one charming picture, Flora even brushes some rainbow bits off of Crispin's coat. At first glance, this book looks perfect for my kids. After all, it's about the relationship between a big sister and a little brother. But, after reading it myself, I decided not to read it to my toddler son. The little brother's fate in the book lies entirely in his big sister's hands, and he doesn't get to say a single word. While the ages of the children are unclear from the text, the illustrations depict them as young siblings. Honestly, I don't think it is appropriate that the mom seemingly placed her tiny tot outside under the care of an older yet still very childish sibling. I feel sorry for little Crispin and also for Flora who unfairly is expected to take on the huge responsibility of caring for her young brother. That issue aside, my daughter and I still had fun imagining what it would be like to blow away on a windy day. Besides prompting the obvious sibling relationship discussions, the book also works well for talking about story sequences. In their travels in the sky the two siblings meet the following in order: a dragonfly, sparrow, rainbow, cloud, eagle, man in the moon and, finally, the wind. A while back I came across a spinning "Fantastic Flyers" pattern in the March 2009 issue of Ladybug magazine. Basically, it is a modified paper helicopter that has a string attached to the top so it flies like a kite. 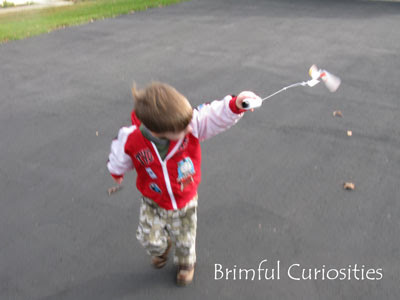 It's a fun toy to make for playing outside, wind or no wind! I unfortunately couldn't find the actual template online. 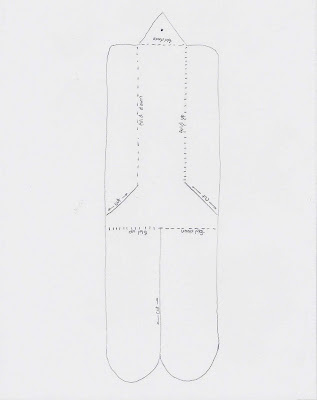 Below is a poor sketch but at least you should get the basic idea. We created a couple of different flyers on regular copy paper. One looks like Flora. The other my toddler decorated with fall colored markers. 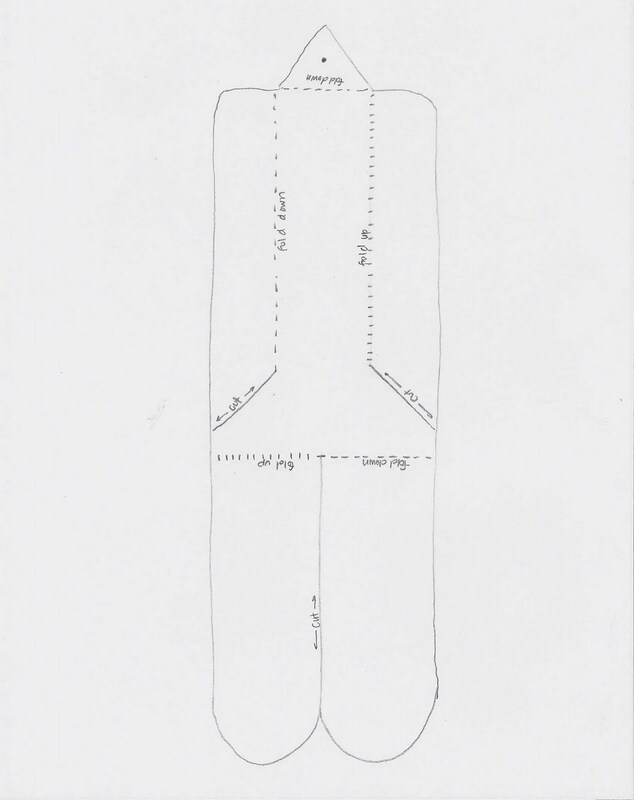 After coloring we cut along the lines indicated and folded the flaps up and down. We reinforced the top with a piece of scotch tape. After threading a needle with some kite string, we poked the needle through the top of the flyer and tied a knot on top. Then we took our flyers outside and ran around the yard, and watched the flyers spin in the sky. Flora gets blown away again! Just a quick warning about the flyers -- the string tends to get wound up and tangled, requiring some adult help. However, the flyers are cheap, easy to make and a lot of fun to fly! Definitely worth trying with your kids. lol - You're such a *mom*! We just can't read anything without deep discernment. :) The illustrations look adorable. I'll have to check it out for E.
Oh such fun. 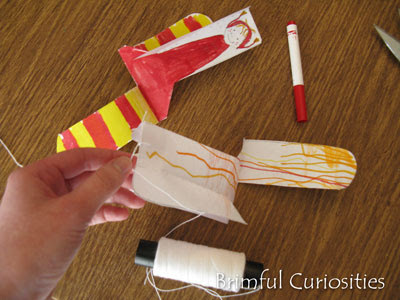 I've been thinking this spring we need to make a homemade kite craft. We have huge kite festivals at the beach every Spring. This would be even more fun then just a simple kite. I am bookmarking this post for future reference. Thank you for the idea! 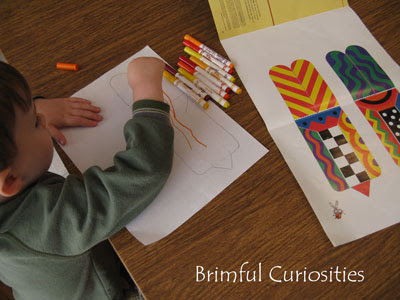 Ooooh, these look cute... and so much fun! Wow! We will have to have a go! Love seeing you over at Kids Get Crafty!! So nice to have you taking part. Thank You!! That's a great craft. (As usual! 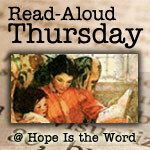 I always leave your Read Aloud Thursday posts feeling inspired...) Too bad the story didn't work out as one to share with your son. This book sounds really interesting. My son would love to make one of these spinny flyers. Thank you for sharing. I love your craft. Great idea to go along with the book. Your thoughts on the book made me think of Max and Ruby. My daughter still loves that show and it still bugs me that poor Ruby is always left in charge of Max - often taking him on the bus all over town!!! Where are the parents? Gosh - I have to check this one out!! I love any books related to fall!!! Thanks for the excellent post, as always!!! I love his little flyer....Such a cute idea! I think your consideration of your son's take on the book is very smart - little ones aren't always able to understand that line between fantasy and reality. Looks like a fun read for an older child though, and perhaps a nice way to discuss responsibility and caring for family even when they frustrate us.